In many ways, I am a poor student of history, though to quote Monty Python: “I’m getting better.” Honestly, prior to this trip, I wasn’t sure what the significance of Jamestown was or who lived there or when it was that they did whatever they did. I knew it was the site of an early settlement, but that was about it. You may correctly infer that I never got around to seeing the animated Disney film, Pocahontas. My bad. Now that I’ve been to Jamestown, I’m pretty gung-ho on the place. Hear me well: If you want to understand how the United States got started, you have to go there. That’s a pretty strong statement considering that Jamestown was founded in 1607, over a century and a half before the Declaration of Independence was sent to the print shop, but it’s no great stretch to say that without Jamestown, this country might very well be speaking Spanish or French as its primary language. I’m not going to lay out a detailed history of Jamestown here. That’s what Wikipedia and Disney movies are here for… or even, hey how about this: You could visit there yourself! That’s a fine idea! I can’t recommend it highly enough. So let me offer a few tips on how to visit the place. That may seem like an odd concept – offering tips on how to visit a place like Jamestown. I mean, what’s there to figure out? You drive there, you get out of your car, you walk into the visitor center and away you go. But you see, there are two huge separate facilities at Jamestown and they consider themselves to be in competition for your tourist dollar. Fortunately for you, we visited both places, and while they cover some of the same material, there are considerable differences between the two sites. Our first stop was Jamestown Settlement. It is located on the mainland, a mile or two from Jamestown Island. It consists primarily of four elements: 1) A full-scale replica of the original fort, complete with a working blacksmith’s shop and various other facilities, all staffed by appropriately costumed docents; 2) A reconstructed Powhatan Indian village (which I confess we mostly skipped due to time constraints); 3) Fully seaworthy replicas of the three ships that brought the colonists over from England in 1607, which we were able to board and tour; and 4) A sizable museum. The museum is quite wonderful. It contains countless artifacts and many well done displays, tracing not just the history of Jamestown, but also the world on both sides of the Atlantic that gave rise to its founding. Oh that? 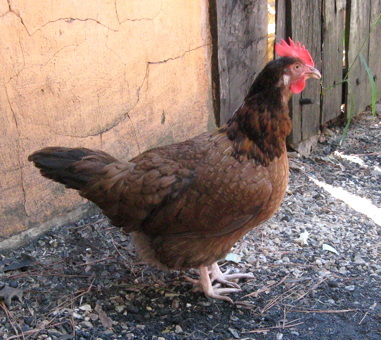 That’s a chicken that stepped into my path in the blacksmith’s shop as if she owned the place. We’re told that she belongs to an heirloom breed that goes back to Roman times, so of course her mug shot gets a place of honor in my account of our visit. Considering all of the history and artifacts on display, one might wonder what a competing facility could possibly offer, but there was one vital nugget of information that was unknown when Jamestown Settlement was built: The precise location of the original fort. That information had been lost to history for years; centuries actually. It was generally thought that erosion of the shoreline on Jamestown Island had put the remains of the fort underwater a long time ago. All of that changed in the mid-1990s, when archaeologists found the fort’s location. It turned out that only a few feet of it had gone underwater. The rest of the fort’s remains, including many fabulous relics and more than a few graves, were all underground waiting to be discovered. That facility is now known as Historic Jamestowne (note the added ‘e’). Historic Jamestowne is an active archaeological site, and we paused to watch real archaeologists as they gingerly troweled at a dig site. Thousands of the objects they’ve uncovered over the past twenty years are on display in an adjoining museum. Included there are a couple of skeletons, representative of the many graves on site. Some of the bones bear the clear indications of cannibalism, dating from the winter of 1609-10, known as the Starving Time, when most of the settlers died. The human price of establishing Jamestowne was brutally high. 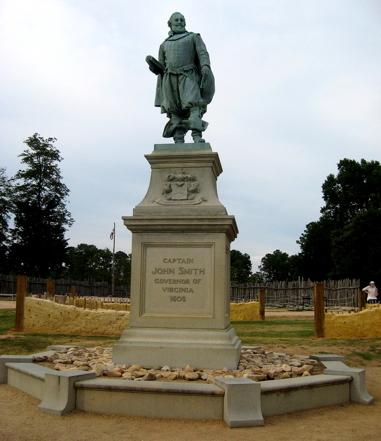 That’s a statue of Captain John Smith. Though his name sounds suspiciously like an alias, I have no doubt that it was his real name, as he was far too egotistical to have ever hidden his true identity. I say that with all due respect; he was a truly remarkable fellow and well deserves his prominence as a key figure in the survival of Jamestown. Queen Elizabeth II and her consort Prince Phillip have visited Jamestown on two occasions (I’m assuming they weren’t around for the Starving Time, but I can’t swear to it). Their first visit was in 1957 to mark the 350th anniversary of its establishment (by a group of Englishmen, in case you’d forgotten). Their second visit was in 2007, when the couple returned to mark the 400th anniversary. I can’t help but wonder whether Liz & Phil thought they still owned the place. I’ve never been too keen on having people tell me what to do, and I try to practice the Golden Rule in that regard, but I’m going to make an exception today for which I hope I will be forgiven: You really ought to visit Jamestown. Or Jamestowne. Ideally both. I will close with a little moment from our vacation that has no larger narrative. 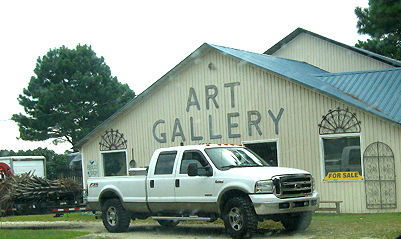 This is the Grandy, North Carolina Art Gallery. The car was moving and we had places to be, so we did not pull over and experience the artistic wonders of Grandy, nor did we get to pet the goats that were jumping about next to the gallery. We will save that for a future Art Galleries with Farm Animals vacation.